A £600,000 scheme to improve access to a site next to Oban Airport to open up a business park opportunity and will be delivered in two phases – the road itself first then the site specification after that. Following approval of the full business case and the granting of planning permission earlier this summer, the first phase of works is being designed and delivered by the council’s own roads team rather than an external contractor, providing best value for the public purse. The 150 metres of two-lane carriageway and single sided footway, with associated service ducting, drainage and street lighting, is expected to be complete by November 2015. 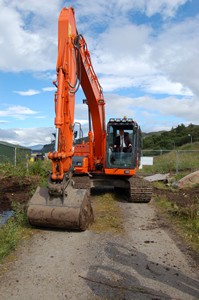 Work started on site on 1st September, with chair of the Oban, Lorn and the Isles Area Committee, Councillor Roddy McCuish, on hand to break ground. He said: ‘’This is a flagship investment programme for the council, aimed at creating the key infrastructure to attract private sector investment in the Oban and wider Lorn area. ‘’It’s fantastic to see the first project beginning in earnest today. The work that is now underway is all about creating a site which appeals to the private sector, making it attractive for investors as a prime business park area, getting them to locate their premises here and bring jobs to the area.